We are delighted to have won PRODUCER OF THE YEAR at The Select Lincolnshire Food and Drink Awards Thursday 6th February 2014 at The PetwoodHotel in Woodhall Spa. Held in Association with Lincolnshire Life Awards this annual event honours the great and the good of the Lincolnshire food scene – and awards top accolades to over a dozen food establishments, producers and businesses dedicated to using the finest Lincolnshire cuisine. This is the second time we have won this award, having won in 2012, and we are so proud of the entire team here. We offer our congratulations to all the finalists. TV Chef, James Martin's new BBC2 series will go on air from 16th to 27th September and will focus on the importance of knowing the real provenance of our food and will highlight the benefits of buying direct from the people who produce it. The Lincolnshire episode will be broadcast Thursday 26th September 6.30pm (check local listings) and covers pea harvesting on the fens as well as Free Range Pork at Redhill Farm. We were the venue for part of the filming for a recent episode of BBC1's Countryfile in Lincolnshire shown on Sunday 16 October BBC1. Presenters Matt Baker and Ellie Harrison and the team spent two days filming with us on the farm and also followed us to Sleaford Farmers’ Market to find out more about the Lincolnshire Sausage for their Lincolnshire feature. We are very proud to be selected as one of the UK 's top 3 artisan sausage producers by BBC Good Food magazine. Their British Food Stars feature in the September 2011 issue celebrates British Food Fortnight 17 September - 2 October and states that "happily, traditional British Bangers, using wholesome ingredients, are alive and well." 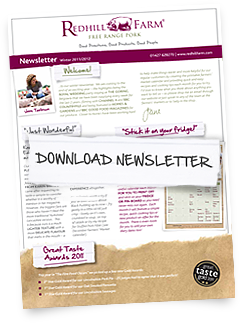 Great Taste Awards 2013 - Results In ! The results of the Great Taste Awards are in - we got 5 Gold Awards out of 6 entries - 4 x 1 Star Golds + 1 x 2 Star Gold - well done team! We won a 2 star gold for our Free Range Pork and were awarded 1 Star golds for Pancetta, Black Pudding, Haslet and Free Range Pork Pie! We were delighted to host James Martin and his BBC film crew over three days this week. The popular TV chef spent time on the farm helping out with the pigs and cooking some of our national award-winning pork in the barn where the feed for the pigs is milled using corn grown on the farm. The BBC TV crew then followed the story of how the pork gets from the farm to the customer with further filming in the on-farm butchery and at a Lincoln Farmers’ Market. Filming on the farm was particularly enjoyable for James and close to his heart having been brought up looking after pigs on the estate farm at Castle Howard, which his father managed. The BBC series will go on air in September and will focus on the importance of knowing the real provenance of our food and will highlight the benefits of buying direct from the people who produce it. Visit our Facebook page to see images of James and the crew during filming and click on 'newsletter sign up' so we can let you know when the programme will be on air. Former England Cricket Captain Alec Stewart took time out from his busy schedule at the Lincolnshire Show to meet us in the Food Court and sample our Pork Pie as he heard it has been selected by Jamie Oliver for all his Fabulous Feasts Hampers at Lord's test matches this Summer. He sampled some pork pie for himself and said it was delicious! Jane & Terry were honoured to meet HRH The Countess Of Wessex on the second day of this year's Lincolnshire Show as she toured the Food Court. She chatted to Jane & Terry about their Freedom Food accredited farm and their national award-winning free range pork. Jane & Terry also received a Highly Commended award for their stand earlier in the day. We are delighted to be featured as the "Food Masters" in the FOOD NOTES section (page 23) of this popular national magazine and it is lovely to see our Lincolnshire haslet given a national mention as well! Winner - Lincolnshire People’s Choice Award ! We are completely shocked and delighted to be joint winners of the 2013 Lincolnshire Co-operative People's Choice Award which we received at The Select Lincolnshire Food and Drink Awards on 7 February. The evening was held at the Doubletree by Hilton in Lincoln where our free range pork is regularly featured on their wonderful menu. The People's Choice Award is voted for by members of the public and as we're not on Facebook and don't have many followers on Twitter and didn't even tell our staff or ask customers, its a great surprise and wonderful to know that there is so much genuine support for our business. Thank you to everyone that voted for us! We will be appearing on Escape to the Country on BBC 1 on Monday 21 January at 3pm. Monday's programme is set in Lincolnshire, helping a couple of retired expats, with a budget of £300,000, return from France and find a rural retreat on home soil. While in the county, presenter Alistair Appleton and the film crew brought the couple to Redhill Farm to see how we farm, produce and sell our national award-winning free range pork and to experience our beautiful countryside – we hope you can tune in! Leading national food magazine Delicious visited us at the farm this Summer and has written a 'Food Hero' article about Jane in the November issue, choosing to focus on how it all started for Redhill Farm Free Range Pork. Of course, for the last 12 years it's been a huge team effort with husband Terry and all the staff at the farm which seems to have been over-looked! Anyhow, we are in good company as chef Richard Corrigan and Celebrity MasterChef winner Liz McClarnon are also featured in the same section and Nigella is on the front cover! BBC Countryfile magazine recommends readers visit us as part of their Food Tour in the Discover Eastern England feature. We love how this great magazine sums us up...."Pork mainly, but what pork!....." Winner Best In Britain - Countryside/Farm Business Award 2012! We are thrilled to have been awarded the title Best In Britain - Countryside/Farm Business in the first Greats Of Great Britain Awards. The public voted us winners of this category in the Grown In Great Britain section of the national awards. We are in good company - other category winners include Marmite, Banksey and Bluebells. Editor Matt Wright visited the farm this Summer and has written a great article on Defra's refusal to protect Lincolnshire sausages and the issue of honest food labelling. National food magazine, Great British Food, features Jane's delicious Black Pudding Stuffed Fillet recipe in the July/August issue page 113 - "perfect for Al Fresco dinner parties!" Great British Food magazine May issue features our Lincolnshire Pork Pies and says they are "little beauties....perfectly seasoned free-range pork encased in the crispiest pastry imaginable – perfect for picnics or just munching in front of the telly!" - we couldn't agree more. UK’s Top Food County Selects it’s Producer of the Year! Redhill Farm Free Range Pork was judged the clear winner of the Lincolnshire Producer of the Year Award 2012 at the recent Lincolnshire Food & Drink Awards. Jane & Terry Tomlinson received the award at the glamorous awards dinner held at the 4*Star DoubleTree by Hilton which already has Redhill Farm Free Range Pork on the menu. To have won Producer of the Year in the same year that Lincolnshire is the UK Food County of the Year is as good at it gets! As always this reflects the dedication and hard work of all the team back at the farm - this is for them. Great Food magazine celebrates local produce in the Heart of England and in this issue features us under the heading,"Among the Porkers - Redhill Farm raises what could well be the UK's best pork." We are very excited to be featured in international magazine House & Garden in the February 2012 issue (page 150) in Taste Notes by Food & Wine Editor, Joanna Simon. Joanna sampled our Premium Black Pudding for herself before selecting it to appear in this prestigious magazine. 2* star gold award for our Lincolnshire Free Range Pork Pie - 25 judges agreed it was perfect! 1* star gold award for our Lincolnshire Free Range Pork Sausages. The Great Taste Awards, run by the Guild of Fine Food, are regarded as the highest standard national awards for all Fine Food and Artisan Producers in the UK. Did you know that The Goring - host Hotel to the Middleton family during the Royal Wedding - has Redhill Farm Free Range Pork on the menu? Every Monday lunchtime our Free Range Loin of Pork is featured on the menu and has been for the last 3 years. Countryside Alliance Awards - Local Food Award Winners East of England region. We are really amazed and happy to be able to announce that we have been selected out of thousands of entries to become the winners of the Local Food Award for the East of England region. We were invited to the House of Lords for the Countryside Alliance Awards ceremony. Terry's appearance on Harry Hill on Saturday was a great surprise! - It showed a clip of him from The Secret Supper Club with presenter Olly Smith. We are delighted to have our Lincolnshire Pork Pies featured in the food section of Homes & Gardens Magazine Feb Issue 2011. Thank you to anyone who nominated us for the Countryside Alliance ‘Local Food’ Awards – we very happy to announce we are Regional Finalists. Further judging will take place in February – fingers crossed!